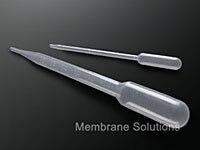 MS® DisposablePipette Pasteur are manufactured with exclusively high-grade polystyrene (GPPS) or polyethylene (PE) which are excellent for clear observation and reducing liquid attachment on the pipet surface to assure accurate delivery. The manufacture environment is mastered by ISO 9000 quality management. Ideal for sampling and for decanting infectious or toxic liquids.